You made a considerable investment in your European luxury vehicle, so you don’t want to risk damaging its top-shelf engine by falling behind on oil changes. One of a kind supercars call for a one of a kind specialty services – like as oil and filter changes, leak diagnostics and gauge checks. Superior auto manufacturers like Ferrari, Lamborghini, Bentley and Rolls-Royce didn’t cut corners designing and building your vehicle, and neither should your European luxury repair shop. At Otto’s European Coach Works, we take extra care with each and every vehicle we work on, no matter how big or small the job is. Most car owners can rest assured that the engines of their vehicles are properly serviced by following the factory-scheduled maintenance recommended by the manufacturer. As a European supercar or luxury vehicle owner, you know this isn’t the case with your top-shelf vehicle. Your special European vehicle needs highly specialized oil change, repair and maintenance services. At Otto’s European Coach Works, we know how important the investment in a European luxury car is and what that investment means to our customers. We want to help extend the life of your vehicle as long as possible. Your fast McLaren or Ferrari or luxury Rolls-Royce limousine deserve the best oil change services money can buy. We have over two decades of experience here at Otto’s European Coach Werks. In that time, brake repair and maintenance for luxury vehicles. 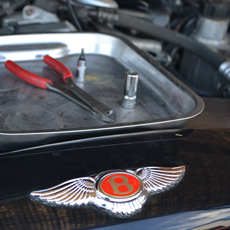 We are also Bentley and Rolls-Royce Certified, giving us a higher level of prestige and preference over your typical auto repair shop. IWe have worked on European supercars owned by some of the brightest and best that Southern California has to offer, and we would love to add you to you to that list of valued customers. If your supercar or luxury vehicle was manufactured in Europe, we have experience working on similar models. Our certified professionals provide expert oil change services in a fast, friendly and discreet manner. Give us a call today and let us help you get the best performance out of your European luxury car.